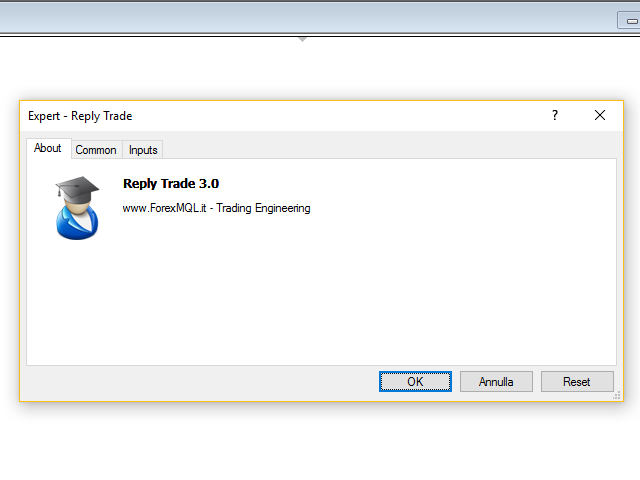 Reply Trade is very simple to use and has very simple settings. 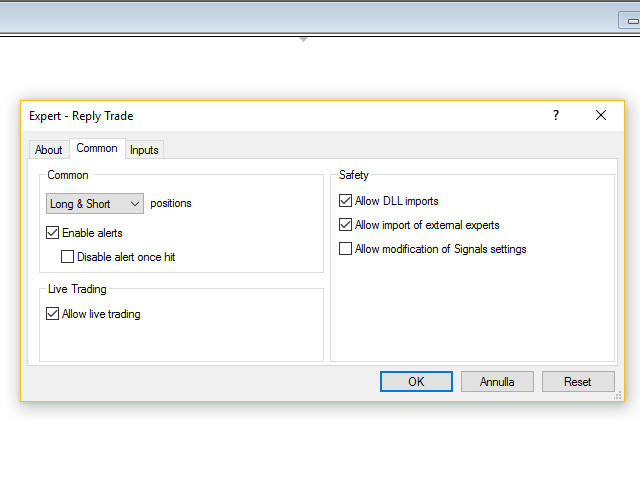 Allow yourself to copy only local orders from one MetaTrader instance to another. No transfer of data via Internet, only local. 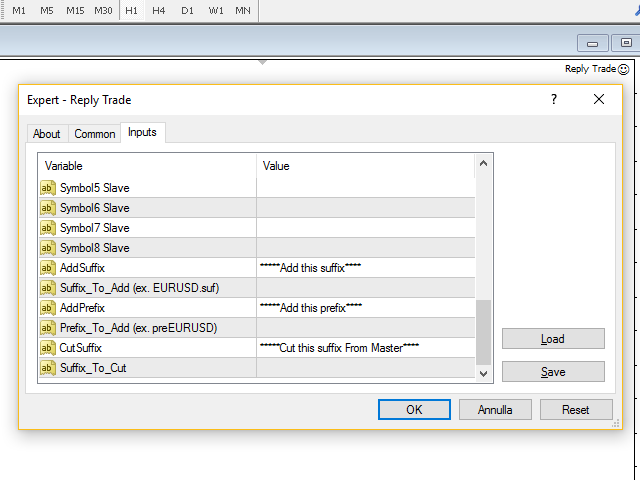 A MetaTrader instance can be Master, Slave or both. Very fast copying of market and pending orders. Note: for MASTER no input to set, charge only the expert on a chart. All inputs must be set on SLAVE. Starts copying the master orders from this time: Leave 0 to use default: current time. Enter a valid date to copy master orders starting from the date in input instead the time current. This option is necessary when the master broker time is before the slave broker time or you want to copy orders from a specific time. The EA copies only orders that time is > date in input. List of different symbols Master-Slave (30 couples): Ex: MasterSymbol1 = "GER30" Slave symbol = "DAX". Put in the field GER30-DAX. The slave receive GER30 and translate in DAX to insert the order. You cannot use several Lot functions at the same time. The orders without stop loss and feature Percentage will not be copied. me ayudarias con la configuracion , el master esta activo , pero el esclavo no logra arrancar , es obligatorio configurar los lotes como el multiplicador y el divisor , todos ? Excellent, efficient and simple EA. Programmer prepared and experienced. Added copying of pending orders. The expert copies only orders with the comment or the magic number in input. 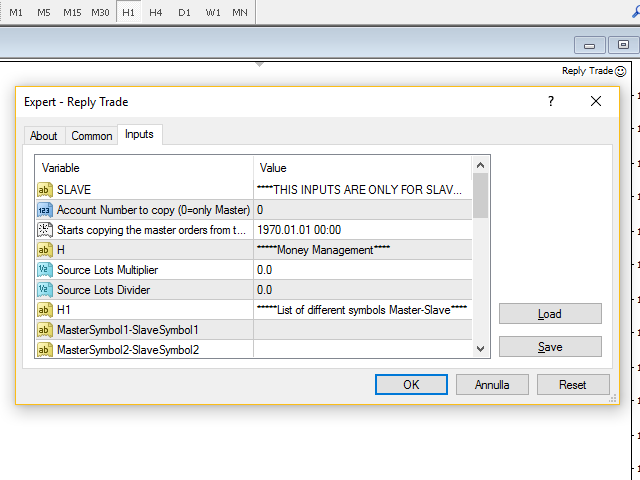 Added the possibility to copy with differents symbols between Master and Slave. 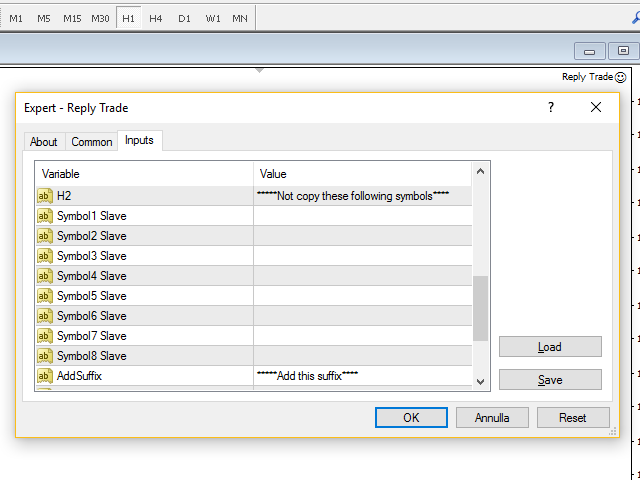 These options resolve the problem when you want copy trades from Broker with suffix. 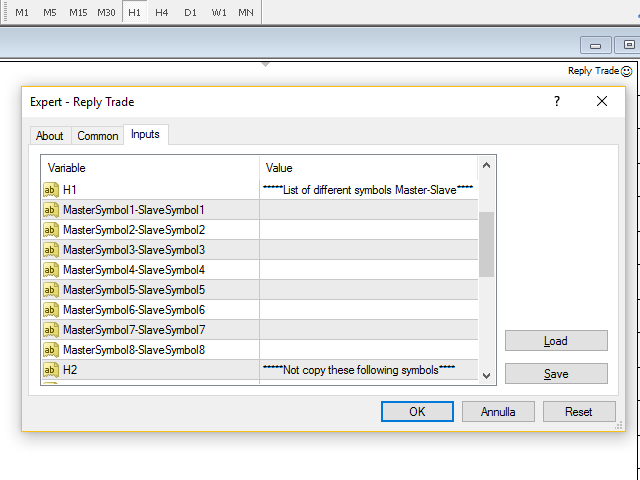 Write only the suffix (ex: .suf) and EA will add it to symbol in slave at right. Write only the prefix (ex: pre) and EA will add it to symbol in slave at left. Write only the suffix to cut (ex: .suf) and EA will cut it from symbol in master.